A law student at the Sri Lanka Law College learned that one of the question papers for the final exams had been leaked. He learned this when one of his fellow students came to another and explained the question that would come up in the exam to be held that day. The student who knew the question gave details of the paper which could not have just been guessed. Having learned about the leakage of the paper, Thushara Jayarathne informed the invigilator for the exam and the principle of the law college. He expected that the invigilator and the law college authorities would immediately remove this paper from the exam and would not proceed with the exam for that paper. However, no such action was taken and no attempt was made to take any actions on the basis of his complaint. He later went to the Koswatha Police to record a complaint and this complaint was also rejected. When he made an attempt to record a complaint at the Commission against Bribery and Corruption, his request was once again turned down. One of the officers explained to him in Sinhalese that it is the law of nature for big animals to eat the small ones, and that if he does not learn to live with this understanding, he may find it difficult to survive. The student managed to record his complaint at the police headquarters. He has also complained by way of an affidavit to the Chief Justice of Sri Lanka and to the Registrar of the Supreme Court. However, no action has been taken to initiate any inquiry into the leakage of the paper or to declare the particular paper invalid. Instead of inquiries, the student himself was brought under severe pressure when the Registrar of the law college made threatening calls, asking him to withdraw the complaint. He also received many threats from many quarters and, for his own security, he had to keep away from sitting for two subsequent papers. He now lives in hiding for fear of his own life. It is believed that a powerful person’s son is sitting for this exam and that this why there is reluctance on the part of the law college authorities and all other authorities to intervene into this issue. The Asian Human Rights Commission calls on the Sri Lankan government and also the Inspector General of Police to provide security for Thushara Jayarathne, the law student who has made the complaint relating to the leaking of an exam paper at the law college. The Asian Human Rights Commission is fully aware of Sri Lanka’s record of causing of forced disappearances and therefore is particularly concerned about the security of this student. The law college is a premier institution for the training of lawyers in Sri Lanka. In recent times, the reputation of the college has begun to degenerate with widespread rumors and allegations of corruption at various levels, including at the stage of admission of students into the college. That the institution that trains lawyers is facing this situation is an indication of the widespread lawlessness that has spread into the judicial system itself, due to the phenomena that is called politicization. In essence, politicization means the control of all aspects of society and life by the direct influence of the executive presidential system. The idea of independence of institutions has been rapidly lost. The Executive President is above the law and not answerable in any manner to any court. 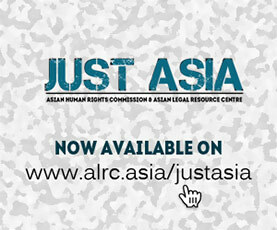 The Asian Human Rights Commission has constantly pointed out that the supremacy of law has been undermined in Sri Lanka and that the authority of the judiciary itself has been reduced to a very marginal position. This incident about the leakage of a question paper is only the tip of an iceberg. The larger tragedy is the rule of law system itself. What will be the role of lawyers who pass exams in this manner? Will they enter the legal profession with any sense of respect for the basic norms of rule of law? Would it be a surprise if young lawyers who pass in this manner would exploit all possibilities of corruption within the legal profession? Some of them also enter the judicial positions. The trustees and authorities of the law college bear the responsibility to investigate into this incident as well as the general criticisms about the corruption of their institution. Many of them may plead that the power balance in the country has so shifted that they are unable to exercise the kind of authority that is required for the running of an institution with required norms and standards. However, this should be no excuse for their culpability. If the situation has so degenerated, then it is their duty to declare it so and to resign in protest. So long as they silently participate in this process, they too are guilty of destroying the very foundations of the rule of law and the legal profession itself.